I did the main focal picture the same, but changed colors. I couldn’t make it EXACTLY like hers! I used Bermuda Bay and Old Olive for my main image, PLUS the new Linen Thread that is in Old Olive. I am always so excited to play with my new goodies that we can pre-order, BUT this was for a December class, otherwise I would have broke out all my goodies! Click on any of the pictures below to be taken to my OnLine Store. Every Online order gets a free gift from me! Thanks for stopping by, hope you stop by again real soon! I love Tuesday’s! Techniques are my favorite thing about stamping. I get to use my Stamps in a totally different way!! The Technique I am using today had me thinking of what I could put BEHIND trees, but still show what I needed it to show. I made a YouTube video showing this stamping technique. I love Birch Trees, I also love the Birthday Delivery Stamp set by Stampin’ Up! I got super excited about being able to use BOTH! When you go watch the video it will show you exactly how easy this technique is to do! 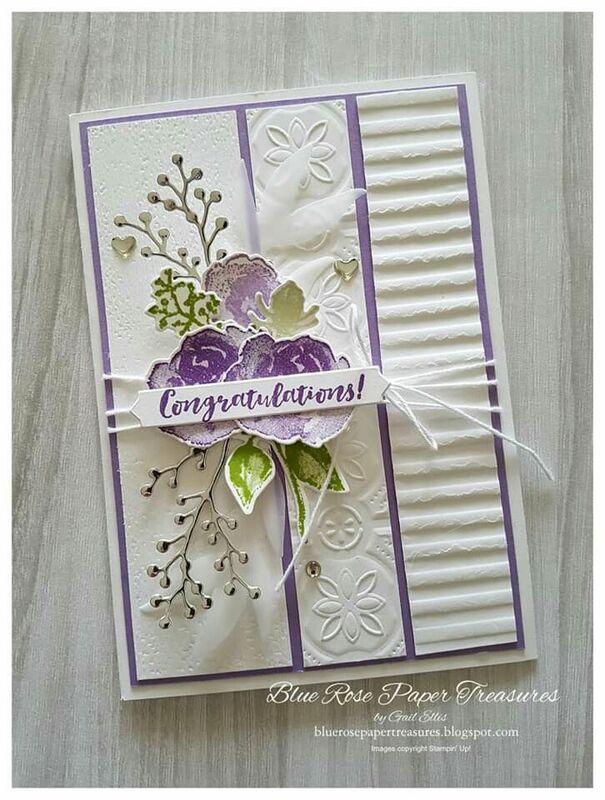 Stamping directly onto an Embossing Folder isn’t something you think of normally. Tips: 1. Stamp on the side that has the negative (dipping down) the part you want as your focal in the folder this will be the part that is raised on your card. 2. Pick images to stamp on that you will see in the lines available that are the flat parts of the folder. 3. Use colors that will enhance what you are stamping. 4. Use a brayer to lay down a color that will be behind the images (sky), anything you stamp over the brayered color will be at the top of the cardstock. 5. Make sure that you don’t move the folder once you put all the stamping in (I did NOT follow this rule on my video, but I fixed my mistake!) 6. Remember that it’s ONLY PAPER, and play with it! I won’t be able to show you here how to do this technique, it would be too confusing, so please go check out my video and see how fun and easy it is. You will notice that you will look at stamps in a totally new way! As always, I will have the supplies listed below, just click on any image to be taken to my OnLine Store! Technique Tuesday! Add a 3D element to any project! Today I am going to show you how to make a 3D element using Mod Podge! If you would like to see this in action, go to my YouTube video where I SHOW you how! First, you will need to pick a shape you want to transform! I chose two, the Pansy Punch and the flower from Eastern Medallions Thinlits. I punched out 3-4 of each image with another one from DSP. I chose the Eastern Palace since it was so pretty. Take your Silicone Craft Sheet, a foam brush, Mod Podge and your cut outs. Starting with the colored images, not your one cut from the DSP, spread a thin layer of ModPodge over entire surface with your Foam brush. Then lay another layer of the image on top of that and repeat. You will do this 3 – 4 times ending with the one you cut out of the DSP (do not put ModPodge on top). Then you can cut into all layers if you want to manipulate the paper more than the design allows. Keep working at it until you are happy with the shape. Once done, you will spread Fine Tip Glue over entire surface, set aside to dry. This is already attached to my card, but this gives you a close-up of what it looks like when dry. In the video I show you how to apply the Flourish Thinlits and how to adhere it to the card! If you wanted, you could attach the flower on front with a Pin, and then mail it to someone who loves to wear brooches, or use it for a headband! I have done in the past a 3d Rose, and that was gorgeous! Please subscribe to my YouTube channel to be informed when a New Technique video is ready! Tuesday is the day I chose, since Technique Tuesday has a certain ring to it, don’t you think? And don’t forget to subscribe to my blog so you won’t miss out on anything here. Today is your last chance to either leave me a message on here, or on my YouTube page, if you click on that link you will be taken to the video where I made this card. You will be AMAZED how much MORE prettier this card is in person! I am off for now, until next time!! As always I will have the list of the supplies used (below) for the card today, just click on any of the pictures to be taken to my OnLine Store!